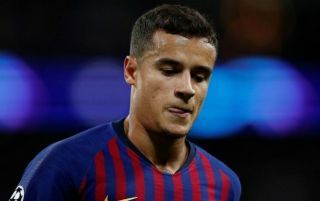 Barcelona will reportedly listen to offers for playmaker Philippe Coutinho, although it’s stressed that they’re not actively looking to sell. The 26-year-old has struggled to hit top form at the Nou Camp this season, managing to contribute just eight goals and five assists in 32 appearances in all competitions. Given how important he is in his role for the Catalan giants, coupled with the fact that Barcelona splashed out around £146m to sign him from Liverpool last year, as noted by Sky Sports, much more is undoubtedly expected from the Brazilian international. However, as he continues to struggle, it has raised question marks over how long he will continue at Barca, and according to Marca, it’s been suggested that while the reigning La Liga champions won’t look to push him out, they could now be willing to listen to offers. That will be a huge blow for Coutinho if accurate, as it surely won’t do his confidence any good while piling the pressure on for him to perform in the coming months to prove his worth to coach Ernesto Valverde and the hierarchy. It could put both Manchester United and Chelsea on alert though, as ESPN note how the Premier League giants have been linked with a summer move for the former Inter and Liverpool ace. It remains to be seen though if either are capable of offering a satisfactory bid to tempt Barcelona into selling, as the Catalan giants will surely want to recoup as much of their initial outlay as possible. Nevertheless, with the report suggesting that they could now listen to offers is a boost in itself if either United or Chelsea, or both, are genuinely interested in bringing the Brazilian international back to England at the end of the season.